I’ve talked about videos being powerful for SEO before, but today I’d like to issue a simple challenge so that you’ll be motivated to take action! But first, let me give you a few quick reasons for using YouTube to improve your SEO. Right now, YouTube is wide open in most photography markets, even for fairly competitive keywords. Not many photographers are utilizing it. Google LOVES to show YouTube results in long tail keyword searches. Things like venues, specific vendors, places, types of photography, etc. Video is a great way to stand out. Google is showing more and more SERP features and the plain blue links are getting less attention. Video is an easy one to dominate. It is extremely easy to get a YouTube video to show up for your brand name (which is a very popular search, especially if you have good word of mouth referrals. So instead of delving into ALL the ways you can use YouTube, I’m going to give you ONE simple assignment. Create a YouTube video that will rank for your BRAND when someone searches for you on YouTube or Google. Don’t worry, you don’t have to do anything fancy. Just having something to show is better than nothing. If you haven’t already, set up a channel for your photography business. Ideally, this will be with the same email address you used to verify your business with Google. You can follow Google’s instructions for setting up your channel here. Keep the name simple. Your brand name is usually enough (and often Google won’t give you any other options). Upload a logo and some cover art (don’t worry too much about this being perfect, just get something up). Create a SIMPLE video to represent your business. This can totally be a slideshow of images with some music. Bonus points if you have a brand video you can use here. You can also just record yourself with your professional camera or your phone. These days, people value REAL. That is why the live streaming videos have taken off in the past few months. That is why Snapchat is so popular. Don’t put out something that makes your brand look bad, but don’t worry about it being perfect. The ideal length for a video like this is around 1-2 minutes. Make sure it isn’t so slow that you loose interest. A really easy way to get started is by using Animoto. With their new marketing video builder, you can easily create a polished video in a matter of minutes. If you have a voiceover or appear in the video, include a transcript. Include some text in the description about your business. MOST IMPORTANTLY include a link to your website! Choose a still frame from the video or upload your own image (dimensions: 1280x720px). Choose a few simple tags. Promote your video (this step is optional, but can help kickstart your ranking). If you want the video to gain the most traction on a platform like Facebook, it would be best to upload it there directly instead of posting a YouTube link. However, right now we just want to get some base views on your video. Having a few hundred views will send a signal to YouTube/Google that your video is a popular choice and it will easily start to rank for relevant keywords. Share your video on your photography business page. Share your video with your friends and family. Share your video in any “sharing” groups or posts that you normally participate in. Check back on your rankings by searching for your keywords and your brand (use Chrome incognito). 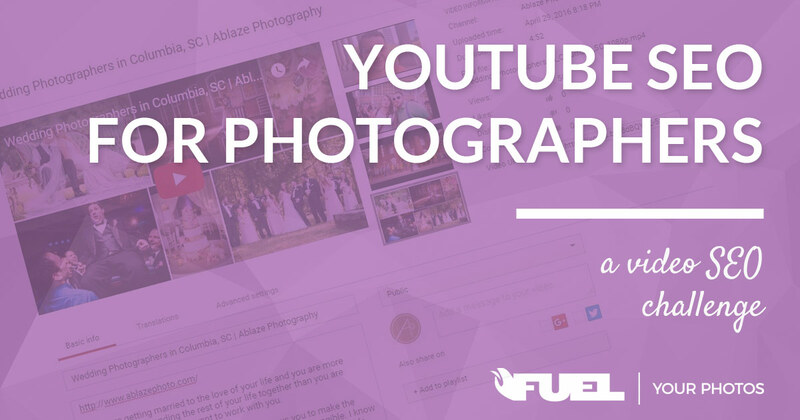 Share a link to your video below in the comments, or head on over to the Fuel Your Photos Facebook group and share it there! We’d love to see that you completed the challenge! Great post Corey. Here’s mine if anyone is interested. Thanks for the shout out. I love this so much! My wedding video is a standard VHS tape! I wish I had something like what you do! Great work Trina! I love that it starts out with you, and moves into your work at a pace that lets me get an overview without getting bored! Great job Paul! Love the testimonials! That will do it. Vimeo videos can rank too, but it is usually much easier on YouTube. I have one question though. 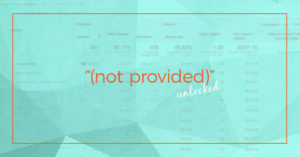 Will Google penalize me if I embed this in a widget on my page AND have it on a blog post? Wasn’t sure if sharing it multiple times would have any negative impact. Thanks! Here is my new promo video !!! 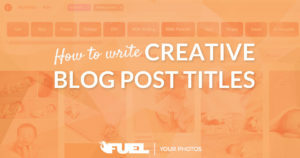 Next PostWhat Should I Do When Multiple Blog Posts Target the Same Keyword?